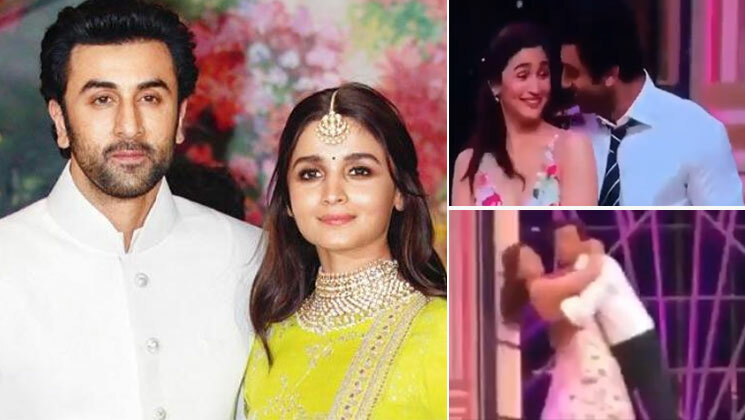 Watch: Alia Bhatt slow dancing with BF Ranbir Kapoor to ‘Ishq Wala Love’ is pure magic! Home Bollywood News Watch: Alia Bhatt slow dancing with BF Ranbir Kapoor to ‘Ishq Wala Love’ is pure magic! Bollywood star Ranbir Kapoor is regarded as one of the best actors of this generation. The 36-year-old possesses pure talent and can pull off any character. Ranbir is dating Alia Bhatt and the duo seem to enjoy each others company. Now, the lovely couple had a romantic evening at the Zee Cine Awards on Tuesday. They slow danced on stage and were also spotted leaving the venue hand in hand. Videos from the Zee Cine Awards shared on their social media fanpages of the lovebirds, show them dancing to Alia’s hit song from ‘Student of the Year’, ‘Ishq Wala Love’. Ranbir takes off his jacket, rolls up his sleeves and asks for Alia’s hand for a dance. Ranbir Kapoor is leaving no stone unturned in charming his love. Next, to them, Kartik Aaryan and Vicky Kaushal are seen laughing and copying Alia and Ranbir’s steps. At one point, Ranbir sweeps Alia off her feet for a twirl and Vicky does the same with Kartik. Very funny, isn’t it? Ranbir once again showed his chivalry and took Alia’s hand and guiding her to their car. A video shows Ranbir telling a man to maintain distance when he got too close for a selfie. At Zee Cine Awards 2019, Ranbir Kapoor won the Best Actor award for playing Sanjay Dutt in ‘Sanju’. Alia lost the Best Actress award to Deepika Padukone. Deepika won her role as Rani Padmaavati for ‘Padmaavat’.Ranveer Singh won the Viewers choice award Best Actor in a Leading Role the for playing Alauddin Khilji in ‘Padmaavat’. Let’s not forget, Alia and Ranbir are working together for the very first time in Ayan Mukerji’s ‘Brahmastra’.